We’ve been measuring philanthropic giving for decades. There are several directories and annual tallies of American charitable giving. For about the last decade, the impact investing movement has been trying to establish definitions, baselines, and annual measurements. It’s a work in progress, but they’re getting there. All kinds of groups monitor and measure spending on political campaigns, including the money (expected to be in the billions of dollars for 2016 Presidential election) that flows throughorganizations registered in the nonprofit code (C4s, C5s, C6s). We also spend a lot on consumer goods that make us feel good – buying things because we think the product manufacturers give back. Call it cause marketing or embedded giving – it’s a significant practice. This is the least well-measured of all of the above practices. 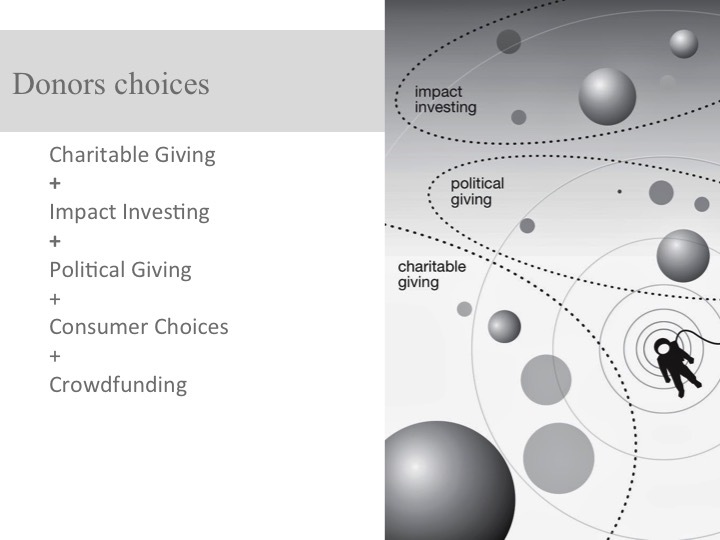 For every dollar an individual chooses to donate to a social or public purpose, she has to make one of these choices: donate, invest, political support, shop, crowdfund. This the universe of choices we face for all the private resources we want to put to public benefit. There’s a lot of information about this behavior that would be helpful. What type of dollar allocation “works” best for what kind of change/outcome? Are these choices complementary or exclusionary? Are people shifting from one choice to another? We can’t get to any of those questions until we first recognize that this is the world we live in, and start counting the dollars in each of these buckets. This we can do. We have data – not great, but something to start with – in each bucket. We should come together and create a unified index that brings the different strands together. Mark the baseline now. Then we can have a meaningful discussion for the 21st century over how people use their private money for public benefit. Donors will be to see their choices better and make better decisions. Philanthropy advisers, like Jamie Forbes of Opus Advisors with whom I was discussing this idea, can better help the hundreds of thousands of families whose money makes up all this revenue make more meaningful choices. 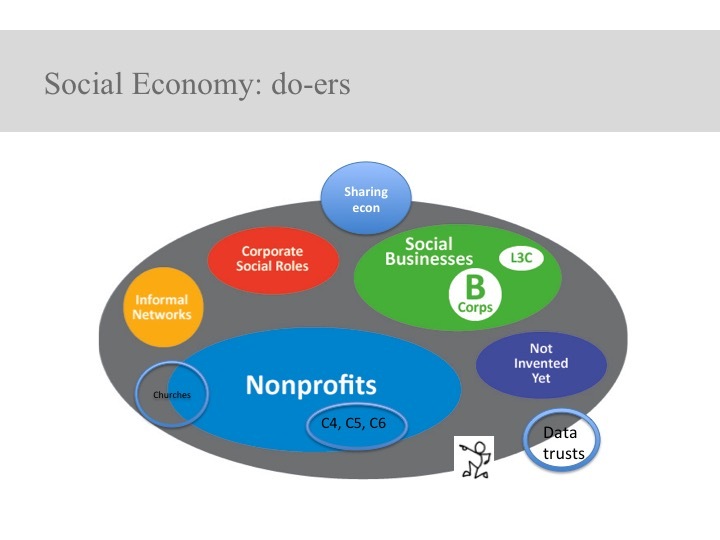 This framework of the social economy has been the basis of theBlueprint series for the last six years. Most people I talk to now see this world, all around them. It’s time we came together and measured and reported on what’s really happening. We need this new index. The data are out there – let’s make it happen. Lucy Bernholz is the author of the blog philanthropy2173, where this article first appeared. The post An index we really need appeared first on Alliance magazine.